The retaining walls leading up to the portals appear to be from the 1909 construction. This is probably the most well lit tunnel in the county. 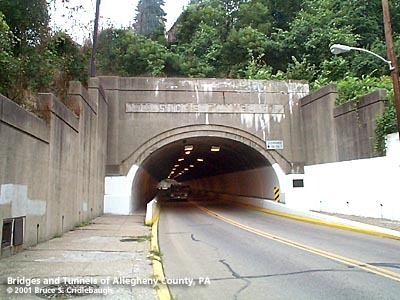 It appears when PennDOT assumed ownership of the tunnel the rehabilitation included new lighting, bright white paint on the lower third of the walls, and Jersey barriers along each wall. The western barrier protects the sidewalk and moves southbound traffic toward the center of the tunnel. This also accounts for the 13 ft 8 in clearance posted for southbound traffic but 11 ft 11 in clearance in the opposite direction. There are no mechanical means of ventilation and no vent stacks. Edwin H. Stowe, associate Judge of Common Pleas 1862-1877, president judge 1877-1903. Stowe Twp erected from part of Robinson Twp. in December 1869 after a similar motion had been defeated two years earlier.